Getting married is still considered a big deal in society, and many people desire to find their soulmate. The wedding industry is still booming, countless books have been written on this subject, and people are getting married every day globally. According to a US poll by Gallup, 56% of Americans aged 18 to 34 want to get married. Because of our sinful nature, all of us began in a marriage to sin. This marriage was a horrible one. You were united with sin and under God’s law. As a result, you were a frustrated man or woman, because you could never, ever fulfill the demands of the law of God. You could never match up to its standards. Therefore, the previous marriage was one of intense condemnation and guilt. It was one of misery and frustration, because you could never meet up to the standards. However, having been crucified with Christ, the church is now in a marriage with Him. You now have a new life, a new Lord, and a new love. You stand no more under the condemnation of the law but under grace. When God sees you, He sees Christ. You are accepted because Christ is accepted; you are blessed because Christ is blessed. God sees Him in you, and even if you slip up, you are still accepted in the arms of the beloved. 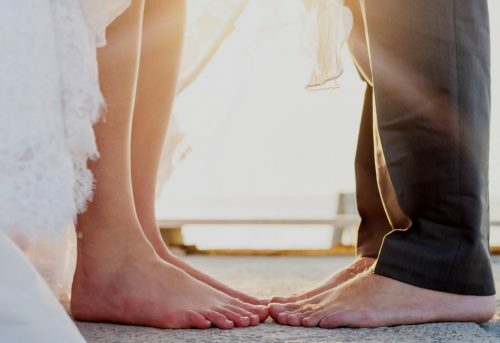 Today, whether you are single, or in an imperfect marriage, the promise we can rejoice in is that we are joined to a perfect, sinless groom, Jesus Christ.